Silver Spiral's exceptionally low resistance allows amplifiers to exert outstanding grip and control over the speakers they're driving, especially at low frequencies. 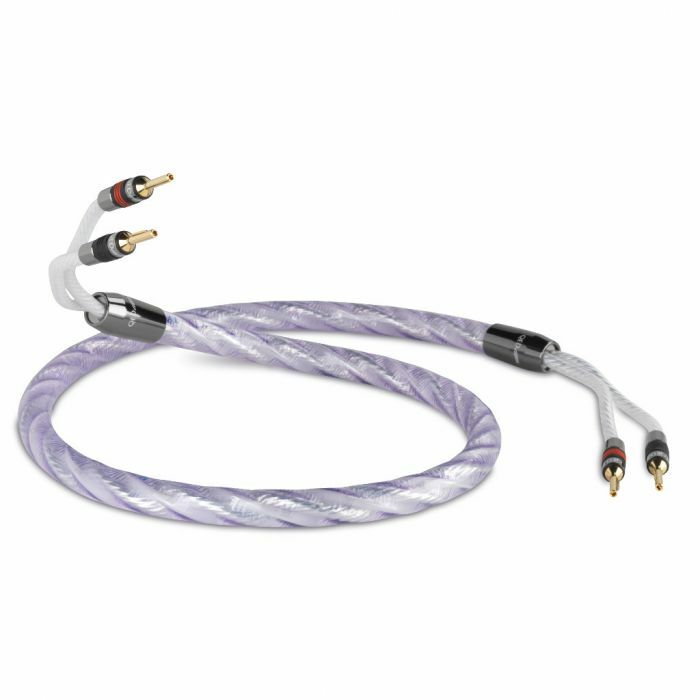 This isn't just another speaker cable it's a high performance audio component .This cable represents the culmination of QED research and development over the past 40 years. QED cables above 2.5 mm2 cross sectional area utilise air core technology to obviate the skin effect by bundling several separately insulated smaller cores together to make up a larger CSA. If these conductors are arranged around a hollow central core of polyethylene the self inductance exhibited by the cable can be reduced to around half that predicted by calculation. Genesis Silver Spiral speaker cable is the flagship QED speaker cable and benefits from a period of intense research and development known as the Genesis Report. Genesis Silver Spiral is a speaker cable with a large cross-sectional area which makes for a very low resistance. This means that the voltage drop across the cable when in use will be so small that it will not have an audible affect on the frequency response of the loudspeakers - unlike cables with a much higher resistance. In addition this has the effect of helping to maintain the damping factor of the amplifier when compared to that measured using cables with a smaller cross-sectional area and therefore higher resistance. Damping factor is a measure of the amplifier's ability to accurately control speaker excursions - especially at their resonant frequency. If it is not allowed to do this effectively, distortion can be introduced into the program material. Genesis speaker cable allows the amplifier to accelerate and decelerate the speaker accurately - reducing distortion. Thus low frequency information in the program material is conveyed accurately to the speakers and bass notes sound tight and punchy with no tendency to become "boomy". Having a large cross-sectional area and reduced resistance would normally give rise to a corresponding increase in loop inductance (and therefore inductive reactance) due to the conductors being more widely spaced. Having a high self-inductance is not usually desirable in a speaker cable as it can affect high frequency performance and introduce an attendant phase shift at those frequencies (at the same time as decreasing the amplifier's ability to correct high frequency distortion components appearing at the speaker terminals). Genesis Silver Spiral speaker cable has a special tubular construction utilising a central air core which effectively reduces the loop inductance of the cable to that of a cable with half the cross-sectional area. This enables the cable to retain its advantage in dealing with transients with no corresponding loss of accuracy and detail at high frequencies. Genesis is able to effectively overcome the skin effect that occurs at high frequencies in cables of large cross-sectional area. This is the effect that causes high frequencies to be carried more effectively in the outer portion of the conductor thus effectively increasing the cable impedance at those frequencies. By having many smaller individually insulated conductors to add up to a large cross sectional area, more of the available conductor area is utilised at high frequencies. At the same time each individual strand is silver plated to ensure that the resistance at the surface of each conductor is as low as possible. It is desirable to keep the capacitance of a speaker cable as low as possible as a high capacitance cable can cause instability in some amplifiers and the Genesis cable achieves this by using insulating materials with very low dielectric constants. Thus for any ordinary speaker cable with the same conductor spacing and cross-sectional area Genesis Silver Spiral will be found to have a significantly lower capacitance per meter.